Doug Baldwin is one player in the National Football League who started off as an undrafted free agent to become one of the best players in his position. He was a good sportsman in his high school and college days before he was picked by the Seattle Seahawks in the 2011 NFL. Since after the draft, he has been playing exceptionally and led his team to their Superbowl victory in 2013 and NFC. Find out more about Doug below. The American wide receiver was born in Gulf Breeze, Florida on September 21, 1988, to African-American Parents and named Douglas Dewayne Baldwin Jnr. He is of African and Philippines ancestry while he holds American nationality. Doug has one younger sibling. Doug Baldwin had his high school education in the Gulf Breeze High School, Florida, the United States of America where was very active in sporting activities like the basketball, high jump, long jump, football, and races (track and field events). Football, however, took the better part of him and he averaged 16.2 as a wide receiver in his senior year with 6 touchdowns. He proceeded to study and play football in the privately owned Stanford University in California, from 2007 to 2010 where he distinguished himself in academics and sports. Although his college career was marred with incessant injuries that almost truncated his career, but for the encouragement and support of his parents which spurred him on, Doug Baldwin succeeded in making a career out of football after his varsity days. He ended his college football career as a leader, with 96 receptions for 1, 360 receiving yards and 13 touchdowns, his kick stats were 30 punt returns for 211 punt returns, while he recorded 28 kick returns for 708 before he graduated in 2010. Despite that Doug Baldwin graduated as the leading wide receiver in his varsity football team, he could not secure a sign up with any of the club franchise during his National Football League Draft in 2011. However, luck smiled on him as he got drafted by the Seattle Seahawks as a free agent in the same year in a 3-year deal worth $1.4 million. The wide receiver had an amazing outing in his rookie season, he emerged the 4th overall on the 2011 NFL’s rookie reception yardage at the end of that season, thus making history as the first free agent to be a team’s leader in receiving yards and receptions since the merger of the AFL-NFL. During the 2012 season, Baldwin changed his shirt Number in the team from No.15 to No.89 relinquishing the later to a new intake: Matt Flynn. He also had a bad outing as he was put out of action by injuries he picked up on the field. Some of his injuries at the time was a dental injury which saw him undergo a corrective surgery, a shoulder injury in week 3 and ankle sprain in week 7. He later bounced back in the 2013 season making a career-high catch for his team with 5 touchdowns, 50-yard receptions for 778 receiving yards in 16 games played and 9 games started by him. Doug also led his team to victory at the Superbowl XLVIII against their opponent the Denver Broncos with a score of 43 to 8. In 2014 after his outstanding performances with the team, he had a 2nd round tender of $2.187 million placed on him for a year, in addition to a 2-year contract deal worth about $13 million. He went on to have 2 Pro Bowl mentions in 2016 and 2017 following his top form and he ended the regular 2017 season outing with a record of 8 touchdowns, 75-yard receptions for 991 receiving yards in 16 games played and started with him. The NFL star has gone on to replicate and even perform better in the 2018 NFL season despite starting his campaign with a shoulder injury. On the other hand, the wide receiver joined his NFL counterparts like quarterback Russell Wilson, Colin Kaepernick, and many others, in protesting against the NFL new policy that requires all players stand for the National Anthem as put forward by President Donald Trump after his campaign in Alabama in September 2017. The parents of the talented athlete are Douglas Snr. and Cindy Baldwin. His father has a bachelor degree in Criminal Justice and holds a Masters degree in Internation Relations. His father served as a law enforcement agent under SWAT, Patrol Team, Narcotics TAC among other appointed assignments before he retired in 2013 from the Pensacola Police Department. He later campaigned under the Republican platform to become his town’s Escambia County Sheriff going up against the incumbent David Morgan. He however, lost the election to the incumbent who secured his third term in office. It is reported that his grandfather was a military personnel and he also has a younger brother Devon Baldwin who he is 14 years older than as he was born in 2002. 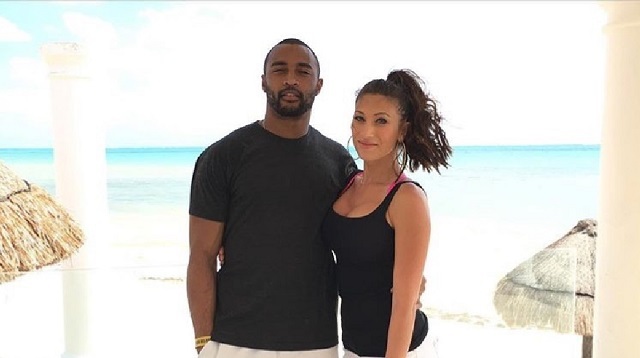 The talented wide receiver was first romantically linked to the pretty sports junkie, Jennilyn DeJesus who he started dating in 2012 but the duo’s highly publicized relationship sadly broke in 2015 with them going their separate ways. The Seattle Seahawks star later moved on, hooking up with Philippines born data analyst, Tara Sabourin. He has already popped the “Will You Marry Me” question since March 3, 2016, although the gorgeous couple are yet to walk down the aisle. We cannot wait to see these pair take their together forever vows soonest. Tara Sabourin works at Atigeo, in Bellevue, Washington D.C. The Gulf Breeze born athlete is 5 feet 10 inches (1.78m) on standing and his average height is complemented by a weight of 87kg (192lbS).